Every year in this space – well, the last 3 years anyway – we get the upcoming baseball season a little bit right and a lot wrong. On the former front, for 2012 I picked the San Francisco Giants to go to the World Series last year, and they did. In case you forgot, they even won the goddamn thing. On the latter front, I had the World Champs being the Texas Rangers, and while they made the silly 1-game wild card playoff, they were toast by that point, and lost to the Baltimore Orioles (!). I had the Orioles and Oakland A's finishing in last place in their divisions – in my defense, so did everyone else – and both made the playoffs. I did not predict the decline of the Phillies, nor the rise of the Nationals. I predicted the rise of the Royals (they stunk) and the mediocrity of the Cincinnati Reds (they were amazing). But the Giants won the World Series, just like they do every other year. This year I'm going to buck some conventional wisdom, draw out some dark horses, piss on a few parades and go for broke with a few of my picks. I've done my homework, having read two season preview magazines. I listened to MLB Network Radio on Sirius XM a bunch during the offseason, and I think I've gleaned a little "insider" information that will allow my prognostication skills to really shine this year. 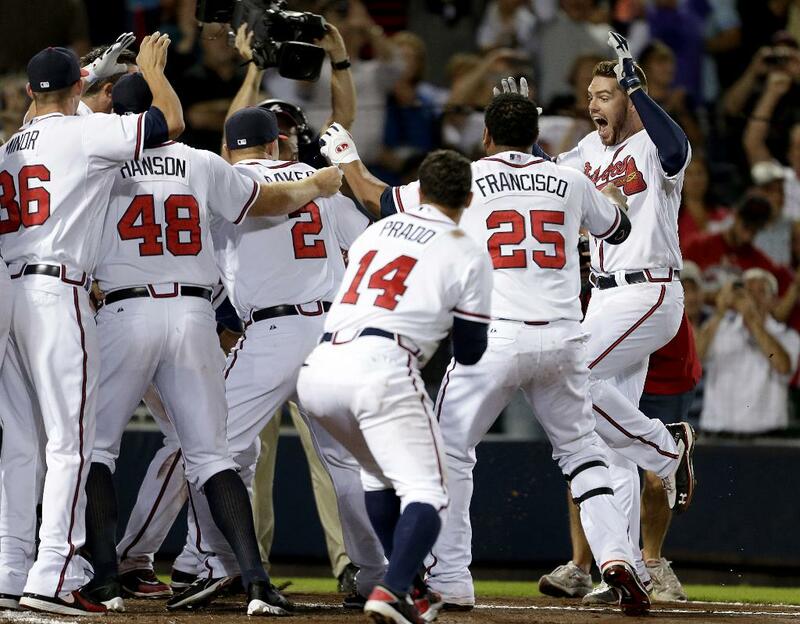 So without further "adieu", meet your 2013 World Champions – THE ATLANTA BRAVES. They'll be besting the LOS ANGELES ANGELS OF ANAHEIM in a 6-game series this October. I'm a big, perhaps foolhardy, believer in the Atlanta Braves, and feel like they underachieve relative to their talent level most years. But this year – that outfield! Both Upton brothers and Jason Heyward, at least two of whom will have monster years in 2013. Craig Kimbrel, the best relief pitcher in baseball by a mile. Freddie Freeman, only the sixth-place hitter on the team but who underachieved with a still-great .340 OBP and 94-RBI season last year. Expect him to rage this year. Tim Hudson, my favorite old guy in the majors. Kris Medlen, a guy who barely threw a bad pitch in 2012. 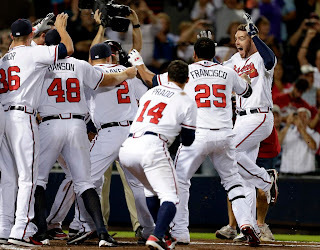 Something about this team looks very fetching this year; would be funny that they only managed one World Series Championship with Chipper Jones in the lineup for 20+ years, but that they'll bring one home this year in their first year without him. Enjoy your La-Z-Boy, "Chipper"! Did you choke on your coffee when you saw last year's last-place Boston Red Sox as my NL East champs, in what's universally hailed as the best division in baseball? I'm pretty sure I'm alone on this one this year, but I'm of the mind that their 2012 was a bizarre aberration of injuries, off years and Bobby Valentine, and that the true talent level of this team laid latent all year. We all have bad years, don't we? That division has 5 very good teams, but two of them are going to regress big-time this year, and I'm super totally psyched to report that one of them will be The New York Yankees, you guys!!! I loathe the Yankees viscerally, and I am dying for them to finally have the sort of lost, soul-sucking, ache-in-the-pit-of-the-stomach year the Red Sox had, or that my Giants have had more than half of the years since I've been a fan (i.e. 1977 up through now). I (incorrectly) predicted it last year as well, but the Kansas City Royals will be quite good this year, just narrowly missing the playoffs due to the rise of Toronto, and the Texas Rangers still having a little something left in the tank. They're my American League team that I follow, and people of Kansas City, let me be the first to congratulate you across the plains that your team will finally be worth watching for a change this year. (Note: Corrected this on 3/22 because I changed my mind with the Dodgers' injuries and a general malaise drifting up from LA....I now think the Giants will take the NL West crown). Just to show you I'm not a total homer, I've got the hated LA Dodgers beating my Giants this year in the NL West. Oh sure, we'll still make the playoffs, but unfortunately, they will be awesome. No, it's not because of their heralded new guys, it's because Matt Kemp and Clayton Kershaw, their homegrown studs, will lay waste to the rest of baseball this year. A full, healthy year of Matt Kemp. God help us all. I like the Nationals, just like everyone else, but I see a little "regression to the mean" this year. What if LAST year was their big wad-shot, and now they'll have to scrap to keep up with true giants like The Atlanta Braves? That's my story, and I'm sticking to it. See you April 1st! Can we just get spring training over with already?